One of the best parts of Autumn is magazines full of recipes of autumnal produce. Especially apples, but also pears and rhubarb, Feijoa and pomegranates. The April 2014 issues has a great photo on the front cover of an old wooden ladder, I’d love a ladder like this in the bathroom. The free packet of Flanders poppy seeds was a lovely bonus – I planted a couple of packets of poppy seeds last year. The chooks then had great fun scattering them over the paving stones next to the garden – one poppy flower out of two packets isn’t quite the success rate I was after. Most magazines, I start at the front and read from front to back, as you do. This time, I turn straight to the apple article by Alison Worth and find 40 shades of apple. I only have 3 of these in my garden: Cox’s Orange Pippin, Granny Smith & Golden Delicious. Maybe we do need to buy the empty section next door and turn it into an apple orchard. 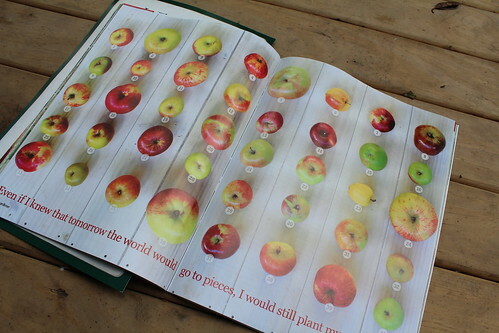 There are 37 more varieties of apple I could plant. 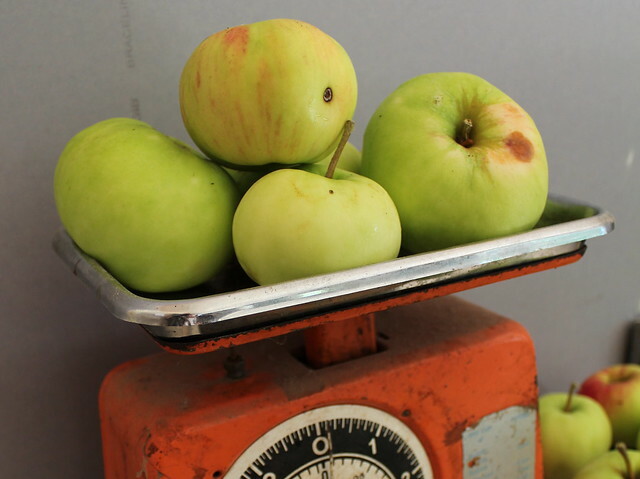 6 apples have more detailed information and an accompanying recipe. The suggestion to use a particular apple for a particular recipe is just that, a suggestion. If you can’t locate a Bramley apple to make the Toffee Bramley Apple Pudding, try to find an apple with similar characteristics. The Bramley is a cooking apple that turns into a lovely pile of fluffy apple purée (and supposed the only apple to use to make apple sauce to go with pork). Hmmm, I’d use my Calville Blanc D’hiver’s in this recipe (if I had some left). Ballarat Apple Shortcake – our local Teesdale orchard sells Ballarat – I feel the need for a wee road trip. I’ll have to get just enough apples for the shortcake as the fridge crisper is currently full to the brim with Braeburn, Royal Gala’s, Red Delicious & Granny Smiths. Ballarat are a good purée apple but for now I will stick with my unknown apple. The purée I get from these is sweet enough to not need added sugar (and they are free). Peasgood Nonsuch Apple, Ginger and Roasted Beetroot Relish sounds delicious. I’d love to grow these apples for their name alone. The Peasgood Nonsuch are another cooker – I already have two cookers: my Granny Smiths & the Calville Blanc D’hiver (which is THE apple to use in a tarte tatin), but surely another wouldn’t go astray. Alison’s Autumy Anti-Oxidant Salad is made with Monty’s Surprise apple. These are huge apples with lots of good medical stuff/properties. Supposedly a late harvest apple and I have a hole in my apple harvest with the fruit from the unknown tree almost finished and it is only early April. Apple harvest can go all the way through to late June and some of the hole will be plugged once the Winter Banana & Kentish Filibasket trees grow a little more. Toffee Cox’s Orange Pippin Apples – toffee apples aren’t really something I considered making as they are so hard to eat. Sticky toffee seems to get everywhere. Toffee Apple quarters would be much easier to eat – and more toffee for apple (not sure that is a good thing). I have a love-hate affair with toffee – often it works just perfect but just as often it all turns to custard (not literally). Caramelised Braeburn Apples and Onions: Tart and tangy, crisp and delicious – Braeburns are the one apple we always have in the fridge. We often have caramelised onions with our American hotdogs – apples seems like a nice addition to try next time hotdogs are on the menu for Friday night. Lastly, but not least, an Apple Crumble with Granny Smith apples from Chelsea Sugar. Crumbles are a regular Sunday night dessert tea for us as The Anster is the master of crumbles. He likes to grate the apples to make them cook more quickly, however I prefer the texture of diced apples. There are heaps and heaps of crumble recipes available – this one has a little golden syrup drizzled over the apples and an oaty topping with coconut. Looks like dinner is sorted for Sunday night. Check out the NZ Garden website for more yummy recipes included the delicious sounding Hedgerow Tart. 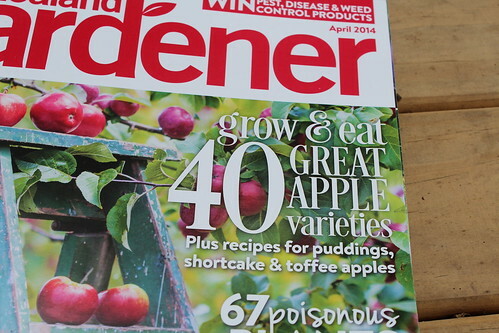 This entry was posted in Apple Varieties and tagged Apple varities, NZ Gardener by Jo Dohrman. Bookmark the permalink. I am trying t find a supply of Bramley Apples in the lower north island or anywhere . I buy Bramley apples from an orchard shop in Gisborne – Teesdale Orchards. I’ve never seen them in for sale at the supermarket or fruit and vegetable shop. Hawkes’ Bay have a lot of apple orchards – failing find a supply close to you, maybe try ringing a few orchards and they might be willing to courier some? I haven’t been out to our orchard shop for a while so I’m not sure if they have Bramley apples at the moment.